Does the caterpillar know the difference between death and transformation? Whether or not it does, it has no choice but to do one or the other. Humanity is facing a similar evolutionary moment right now. Nothing we do is going to bring back the old ways of living, but nothing we are doing appears to be creating new ones. The old stories are no longer serving us, but the institutions created by them are still holding us fast. There’s no way for an individual to truly break free, though many of us are trying desperately to do so. The problem we’re facing is a collective one and it will take the cooperation of every one of us to solve it. We’re luckier than we seem to know right now, however. For the first time in our existence, we can see the extinction event coming. We have discovered and named the ages of geologic time and we know that we are in the Anthropocene. We have the capability to be aware of our predicament, and to know that we have literally changed the world. Since the problem is of our own making, we may still be able to unmake it. Gaia is finally aware of herself. She has seen her own face at last, and all of her parts can communicate in ways that were never before possible. The organs of this awareness in the form of humanity have brought her to this moment of change, and like the caterpillar, we will either transform in ways we can’t imagine, or we’ll die. We can only emerge from the chrysalis as a whole. Our awareness of this truth is the key to our survival. Nothing less will change the acid balance of the oceans and the carbon concentrations in the air. We stumbled onto a seductive, lethal means of powering our existence that changes the most delicate organ Gaia has; the atmosphere. As our dependency grew, however, the effect we are having on another organ, the hydrosphere, also began to push the biosphere in a direction that will eliminate many other forms of life. Luckily for us, the fact that the atmosphere changes so quickly is one of the things that we can use to rebalance the systems in a way that will allow us to survive. Our awareness is the best tool we have to do this. Many of us already know this. Some peoples have never forgotten this basic truth, that we are one organism and what we do to that organism we do to ourselves. Others of us are learning, but what we haven’t managed to do is create that awareness as a planet. We are changing, we have seen our face, but the stories each part of us tell about ourselves, and most importantly about others still hold us back from knowing who we are, and acting as one. There is no “them,” there’s only us. Many solutions are growing, nevertheless. Some think that if every human being meditated regularly, this would save the world. Others think that if we all ate vegetarian food, we’d do it. Others think that we all just need to get right with God. None of these things will work, but at the same time, all of them will. We’re like the people in the darkened cave, trying to figure out what the elephant looks like. 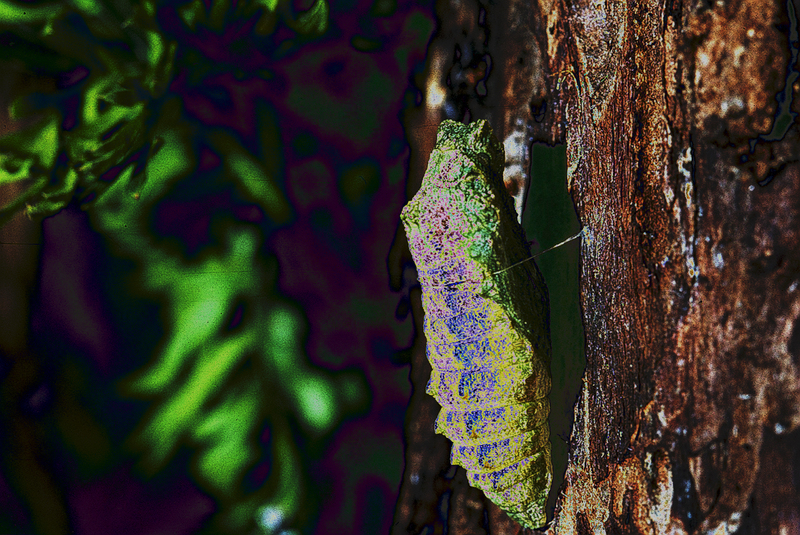 Each rigid solution is but a facet in this chrysalis that holds us fast. We’ll come out in our own time. It’s inevitable. Parts of us will die. I’m sure the caterpillar feels as if it is dying as its very body re-forms. The soft caterpillar legs give way to the exoskeleton-clad limbs of the butterfly. We have lost many species and will lose many more. We may lose the coral reefs, cities may slowly fall apart under ocean waters. The polar bears and the caribou may be only a memory, like the passenger pigeon and the Yangtze river dolphin. Like a large ship that did not notice a small deviation from its course until late in the voyage, the corrections we have to make will be far more extreme than they would have been had we noticed earlier. We’ll still get where we’re going in the end, if we choose to make them.